the magic continued on the fourth of july when we came home that night to have a BBQ with our ward friends the Swindles and Obas. We like them a lot. Since David spends so much time studying, we usually spend our limited hangout time with my old roommates or our family, but we love making new friends! i think we’ve really become the ward socialites lately, so we feel pretty cool. jk. 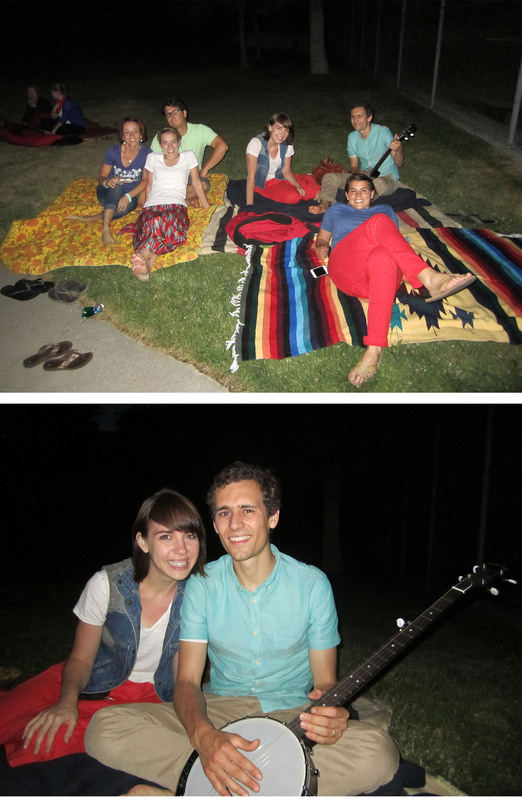 after the BBQ at the Swindles house, we went up to 11th Avenue park and watched the fireworks over the whole valley. David brought is banjo so we could still have some musical accompaniment to the fireworks. some all-american music, at that. while we were at the park, a european man whom we overheard saying, “now what is independence day, exactly?” asked david to play the american national anthem on the banjo. that thing got a lot of attention! i think maybe he should give up school and start a music career. This entry was posted in salt lake city and tagged BBQ, fireworks, fourth of july. Bookmark the permalink.